If you're looking to accept credit cards online, you need to meet certain payment card security standards - PCI compliance, to ensure your customers’ is protected. With PayPal, you can spend less time dealing with data security and more time growing your business. PCI DSS (Payment Card Industry Data Security Standard) is a set of comprehensive requirements all businesses that handle credit and debit payments must comply with, regardless of size or number of transactions they process. The requirements for maintaining PCI compliance include completion of an annual PCI self-assessment questionnaire and a quarterly network scan. Visit the PCI Security Standards Council. If you manage transactions yourself and touch, store, or transmit credit card details, you’ll need to obtain PCI compliance certification for your business. For help, contact a certified security partner, such as Trustwave. PayPal has achieved PCI DSS compliance certification under various programs and standards. * This underscores our commitment to security as well as the protection and integrity of customer data. Our most popular products, including Website Payments Standard, PayPal Checkout and Invoicing are already PCI compliant. And, because we handle the payment card information for you, you can forget about the time, cost and headache of maintaining PCI compliance. 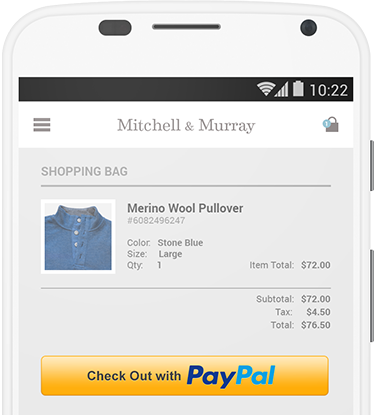 PayPal stores your customers’ credit and debit card information more securely. We don’t even share it with you, so you don’t need to worry about putting their data at risk. By accepting PayPal, you’re telling your customers you take their data security seriously.